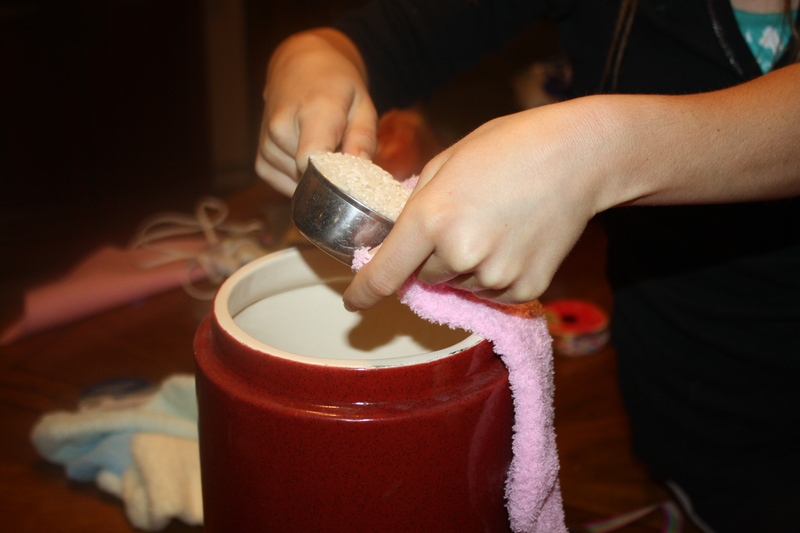 I had to take a time out from cleaning to share with you this recipe for DIY Furniture polish. I have to admit, I’m starting to become addicted to this whole DIY world. 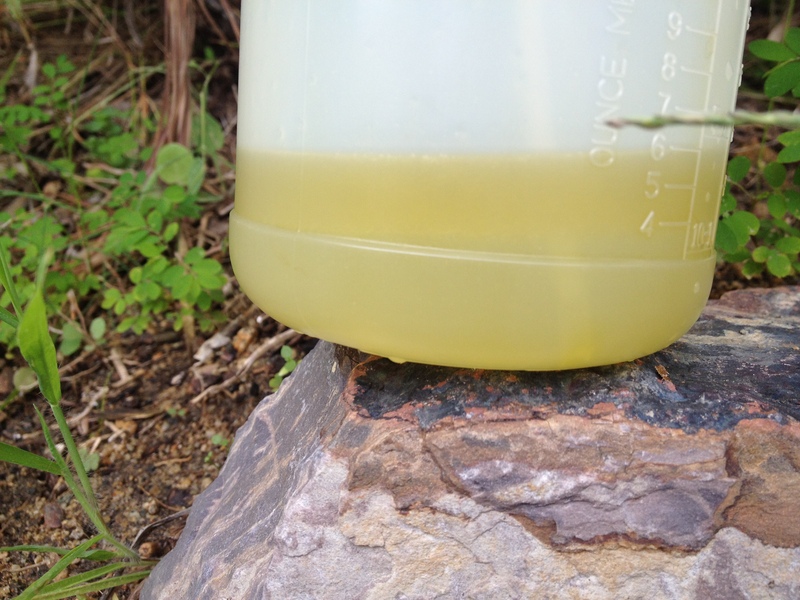 I love the idea of making my own all natural products at home. Besides for the fact that it’s better for my family’s health and the environment and it costs way less, It’s fun! This recipe doesn’t make a lot so you can double or triple it if you would like, but it goes a long way. I’ve been polishing everything in my house for the last two days. From my table, kitchen cabinets, granite countertops, to my stainless steel appliances. My kids better watch out I’m on a rampage ( a little olive oil and vinegar couldn’t hurt, right?) I came across this recipe in one of my Allyou magazines. I don’t think I will ever buy furniture polish again. It gave the wood a light shine but cleaned it at the same time and even though I could smell the vinegar, I didn’t mind. I buy olive oil and vinegar in bulk and I have a lemon tree in the back yard so this literally cost me pennies to make. So here it is, DIY furniture polish! 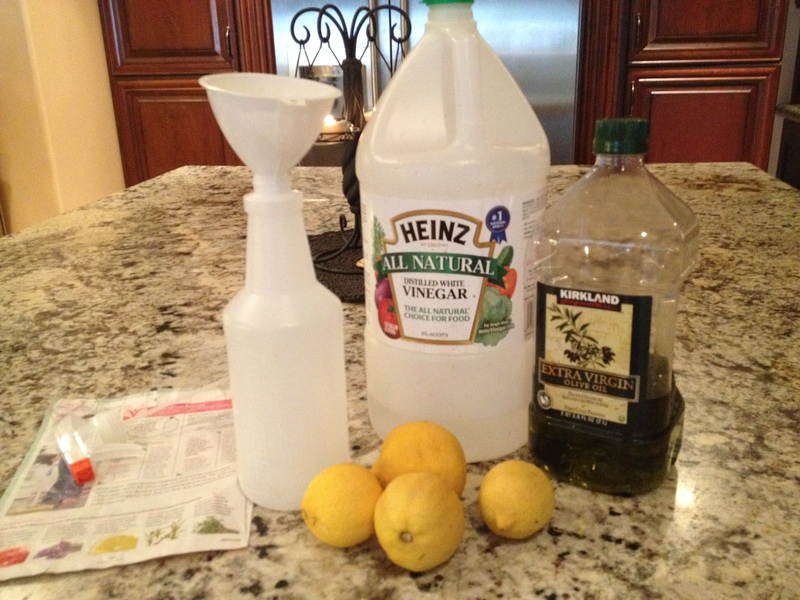 Using funnel, pour olive oil, vinegar and lemon juice into bottle. Shake well to emulsify. Squirt polish onto microfiber cloth and rub onto finished-wood furniture. Always go with the grain and evenly distribute polish. Remove any excess polish with a clean cloth. My daughter plays travel softball and just recently her team made it to a big national tournament. We thought it would be fun to make matching headbands for all the girls on the team. This was a fun project for my daughter and I, and the headbands looked adorable on the girls. You can choose any color combo to match any teams colors. 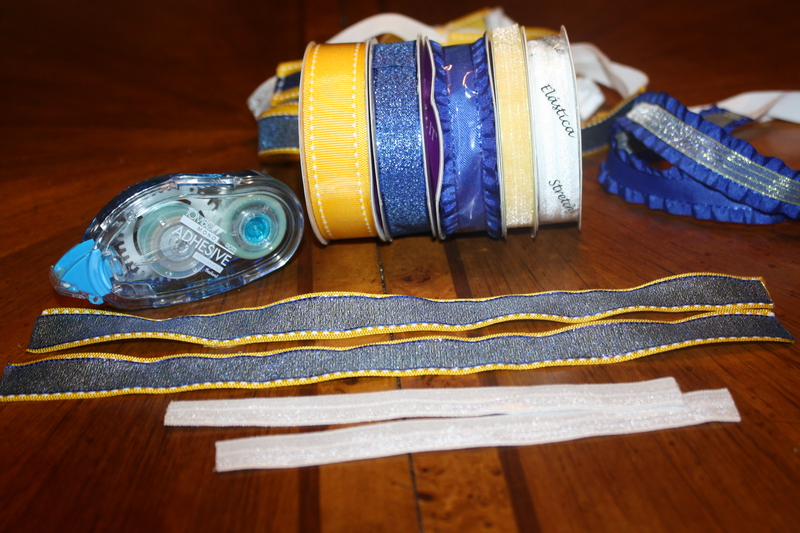 You could even make headbands to match any outfit for school. At the beginning of every school year I make matching hair accessories for my daughters new outfits, it’s much cheaper and way cuter. 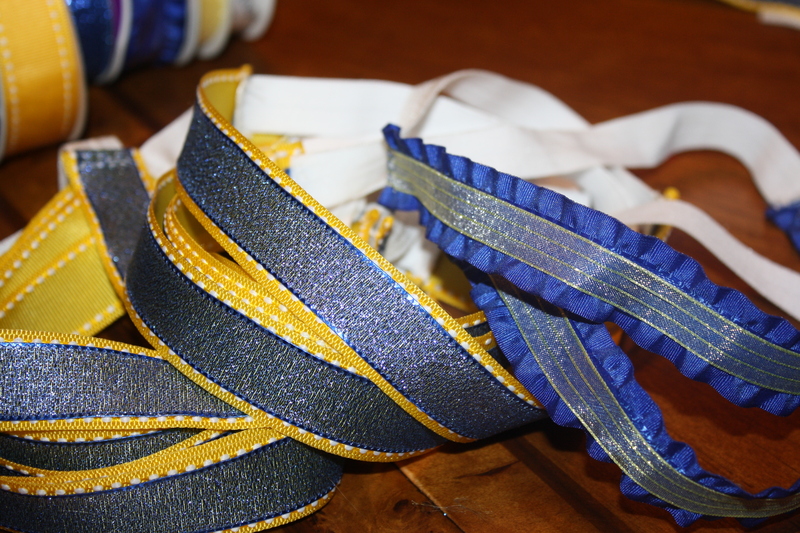 I’ll show how to make bows and clips in another post. First we went to Micheal’s to pick out our supplies. 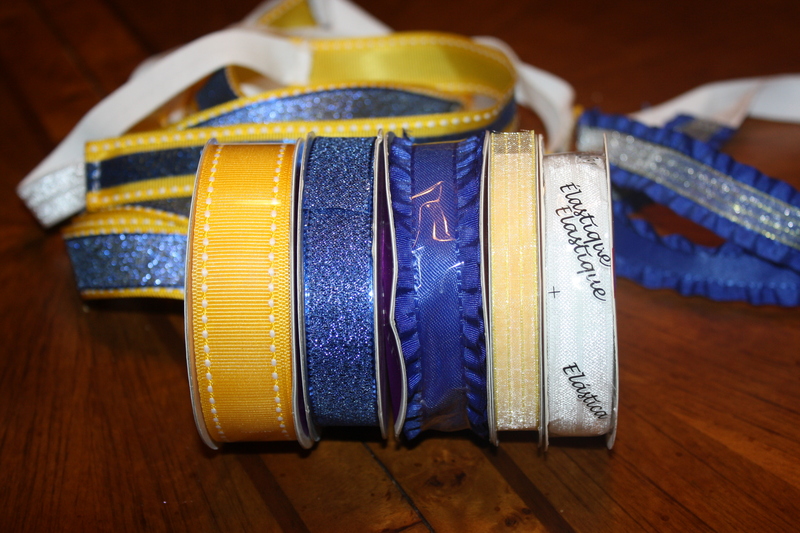 Choose two colors of ribbon. 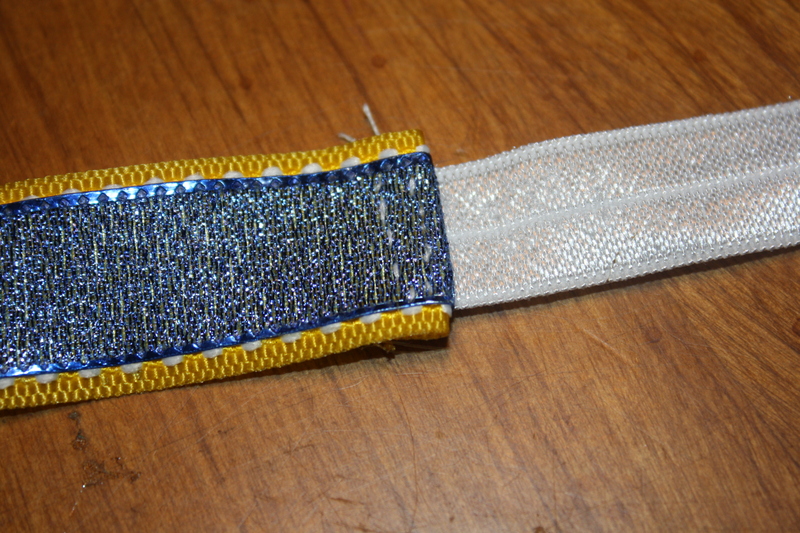 You want the bottom ribbon to be wider than the top so both colors show. I measured the ribbon to my daughters head then cut both colors the same. You will also need elastic. It is sold by the ribbon. 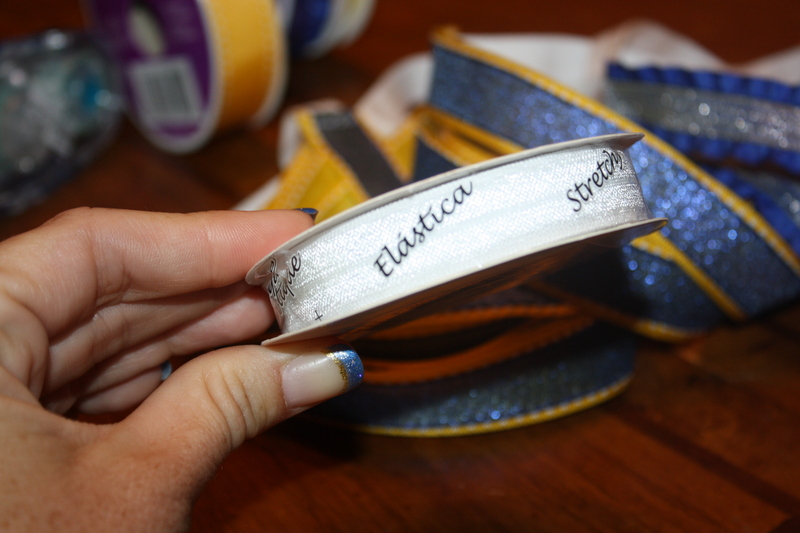 Cut pieces of elastic, remember that the elastic stretches so you don’t need that big of a piece. 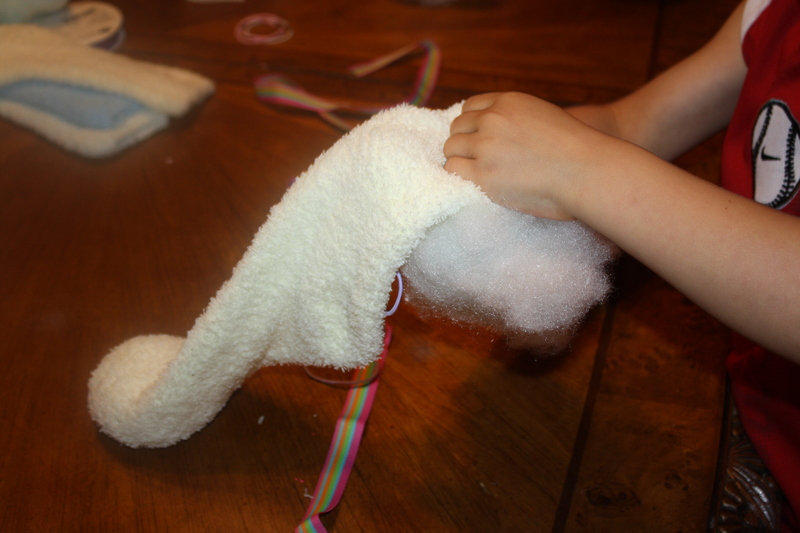 You want the headband to fit snug so it does not slip off. 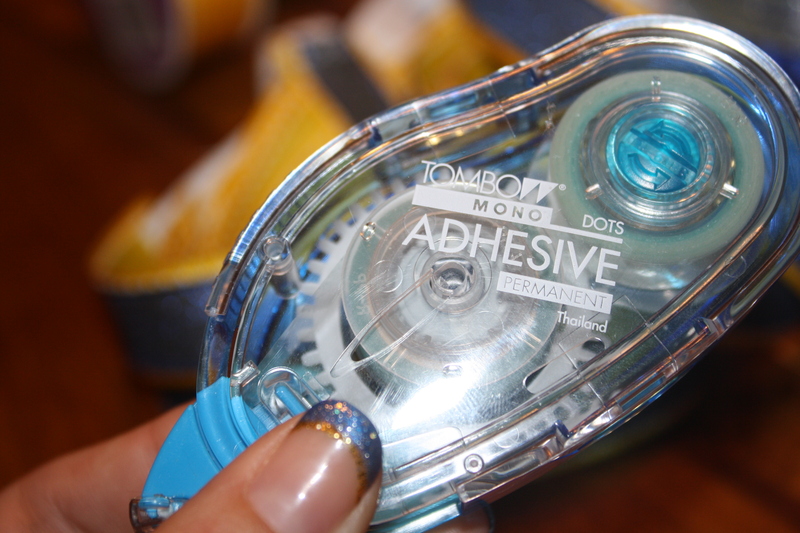 We used a permanent glue to glue both pieces of ribbon together. this is what it looks like. Make sure it says permanent. Once everything was cut and glued we carefully burnt the ends of the ribbon. 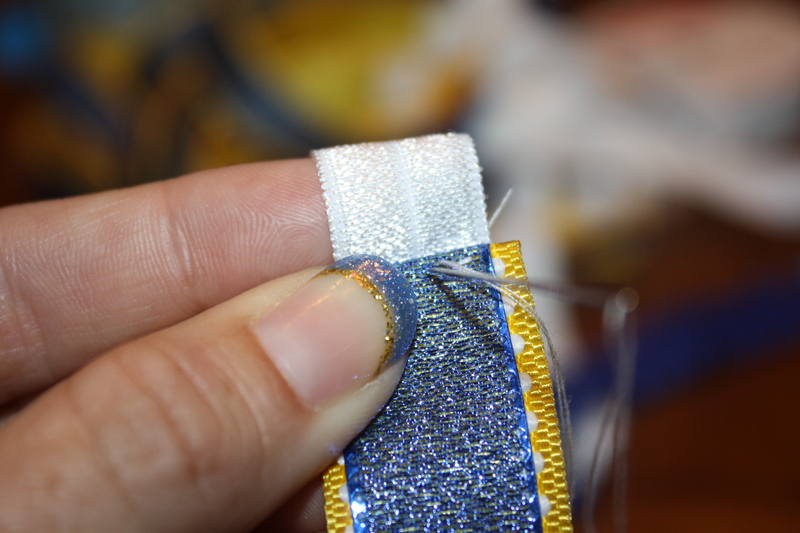 This is to prevent the ribbon from fraying. 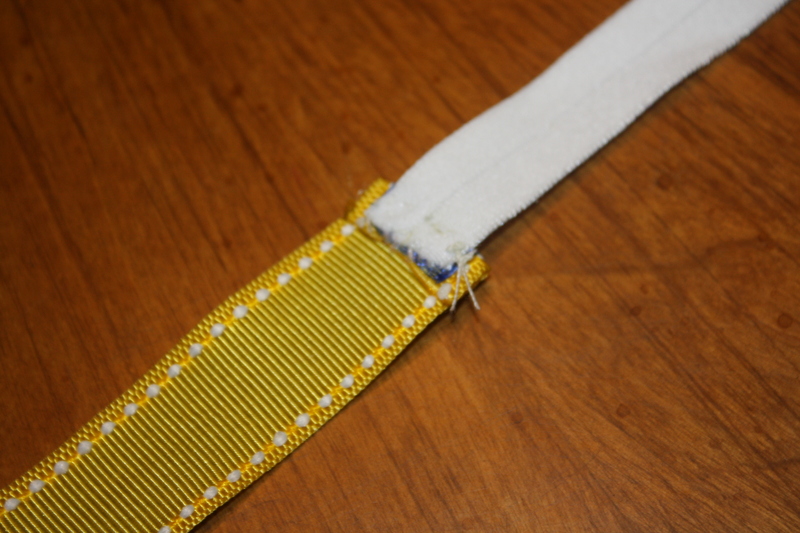 Then we sewed the elastic to the ribbon. Then you are done! We made one sample first to make sure that it fit and that everything looked right. 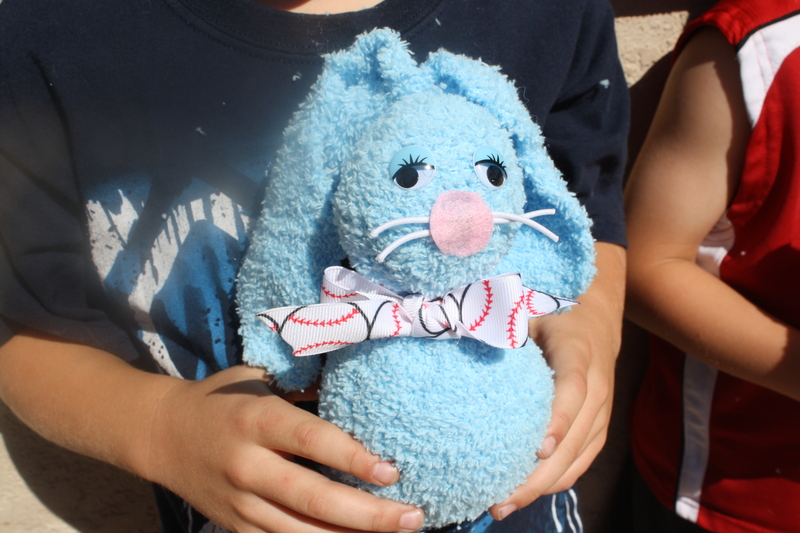 I was watching my cousins little boy for him today and thought it would be fun if we all did an Easter craft together. 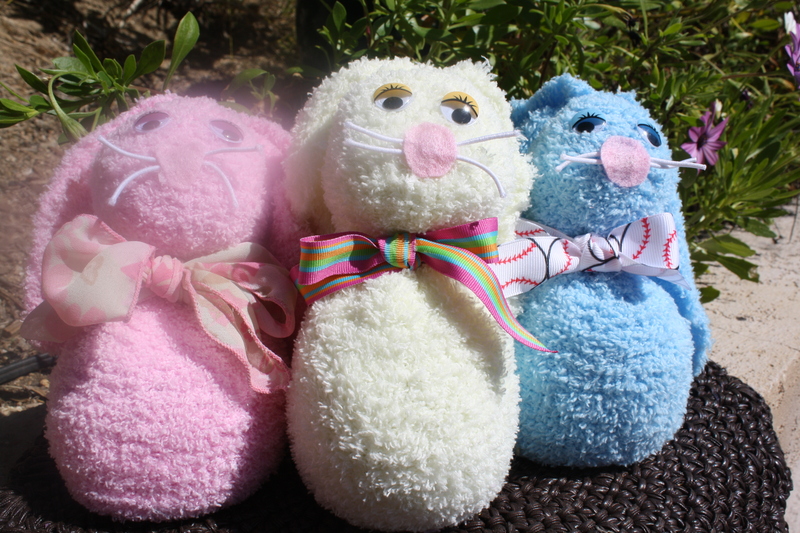 The kids (and I) had a lot of fun making these sock bunnies and I think that they turned out super cute! I got the idea out of my Phyllis Hoffman Celebrate magazine (my favorite magazine, and I subscribe to about 7 different ones). Here is a list of items you will need. I already had about half of these items and the rest I went out and bought. Step 1: Place rice in bottom of sock. 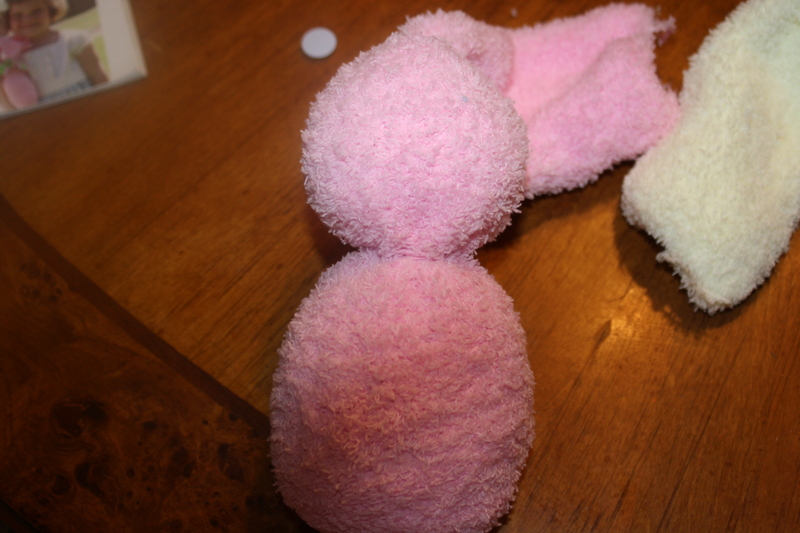 Add one handful polyester fiberfill for bunny’s body. Secure with colored ponytail holder. 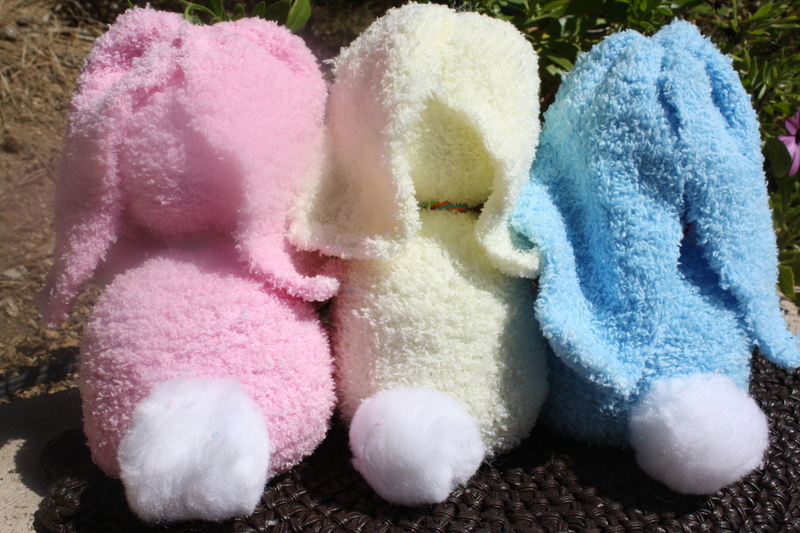 Add polyester fiberfill to form bunny’s head. Secure the top of head with second colored ponytail holder. 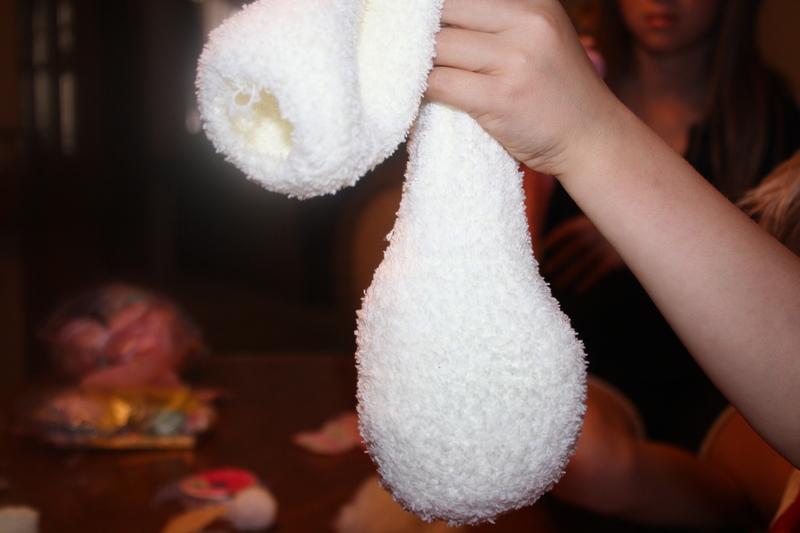 Glue pom-pom to the back of body to make the tail. 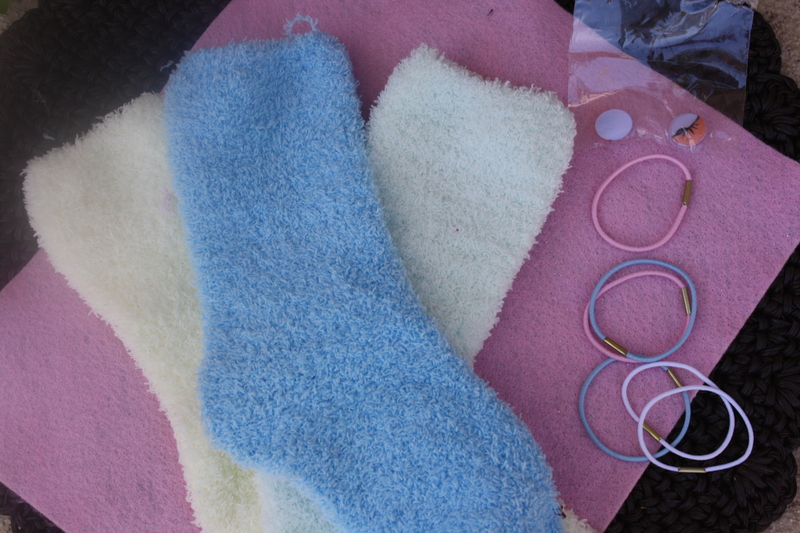 Step 2: Cut each white ponytail holder into 2 (1-1/2 inch) pieces. 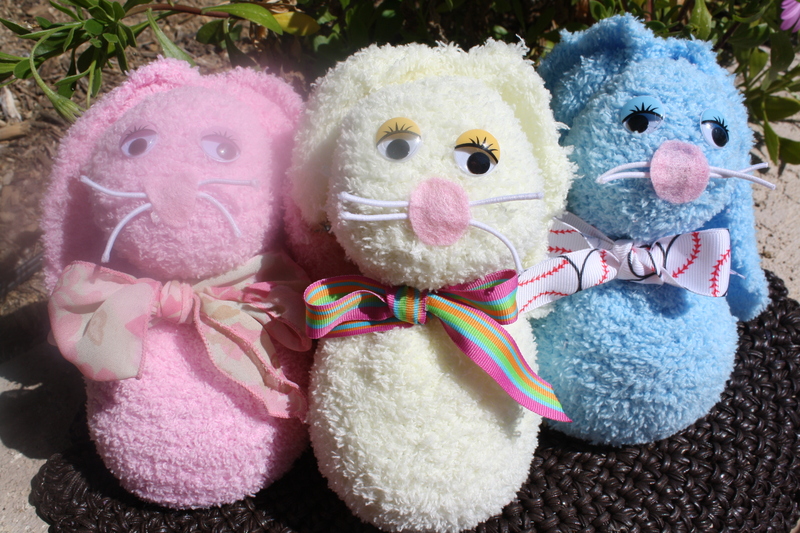 Apply a generous amount of glue in center of bunny’s face, and carefully place ends of whiskers in glue. Top glue with bunny shaped nose cut from pink felt. 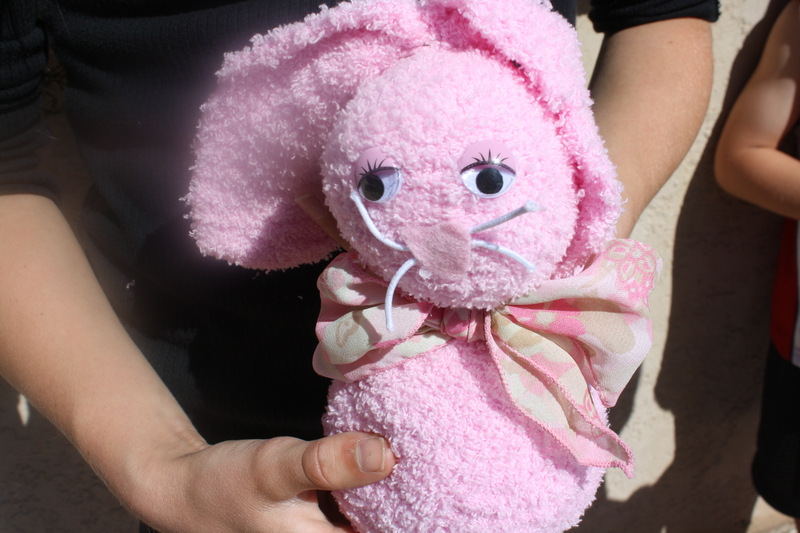 Step 3: Glue eyes on bunny above nose and whiskers, and tie ribbon around bunny’s neck. 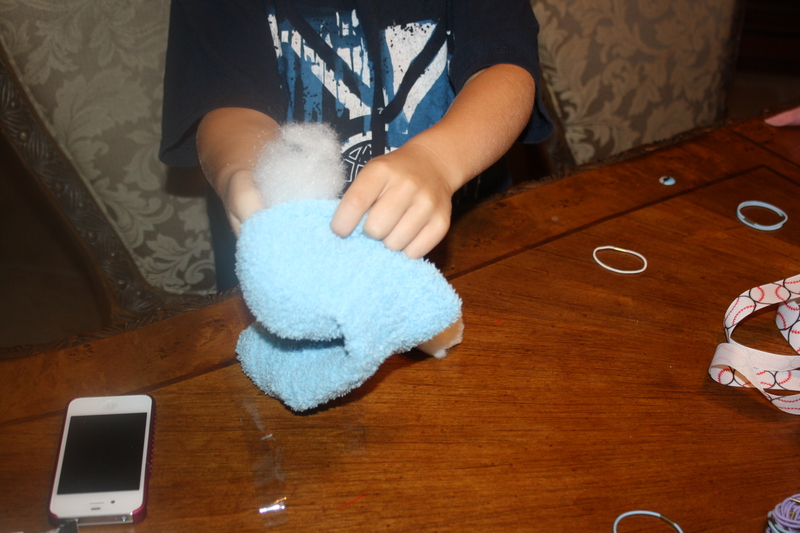 Step 4: Cut the sock’s cuff down the middle to form bunny’s ears. Cut tips of ears into a rounded shape.